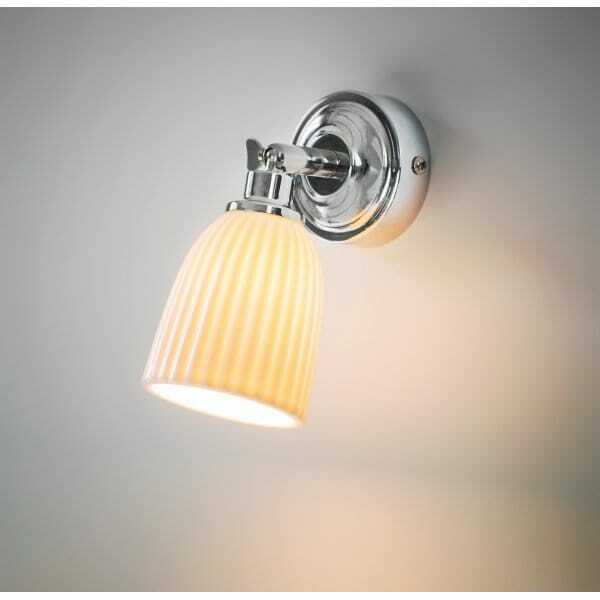 Elegant and stylish, this Alma Bathroom Spotlight in Chrome by Garden Trading will look lovely in a bathroom, cloakroom or another room of the house. A beautiful and modern indoor wall mounted light with a chrome finished base and an eye-catching fluted ceramic shade, the Alma spotlight can be angled to shine light where you need it. Showing 2 of our total 3 reviews, with an average rating of 5 stars. Read all 3 reviews for Garden Trading Alma Bathroom Spotlight Ceramic - Chrome. So happy with two I ordered earlier this year that I ordered two more for our ensuite. Fantastic value, soft white light, beautiful quality and value for money. Electrician said easy to install. Been asked many times where I got them from. Very happy to recommend. Absolutely lovely little lights, we're having our bathroom renovated and was looking for something that had a vintage look to go either side of a large Venetian mirror and these are exactly what we wanted. Not installed yet but electrician thinks they will be easy to fit. Really nice white glass shade, more off white than bright white, again exactly what we wanted. Great quality and an absolute bargain at this price. Very happy to recommend.